Canine Good Citizen is an official title! This means that CGC can be listed on a dog’s record and the owner may use the suffix, “CGC” after the dog’s name. The Canine Good Citizen (CGC) test is designed to reward dogs who have good manners at home and in the community. This class prepares you for the 10 part CGC test. 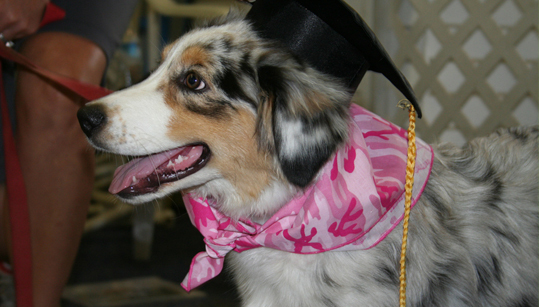 Many therapy dog organizations require the CGC title. In addition, many rental offices and/or landlords also require the CGC title. For more information on the American Kennel Club Canine Good Citizen Test check out www.akc.org and type in Canine Good Citizen. Smrtdog no longer offers group classes. However, Smrtdog does offer privates for all specialty classes. Privates are $150/hour or $500 for 5 one hour sessions. $75 for 30 minute sessions.